In the Huna tradition of Hawaii, there are seven elemental forces whose all-pervading energies flow around us in abundance. Each of us has the ability to easily tap into this rich source of energy to aid us in any situation, empower ourselves and our actions, and manifest good things in our lives. 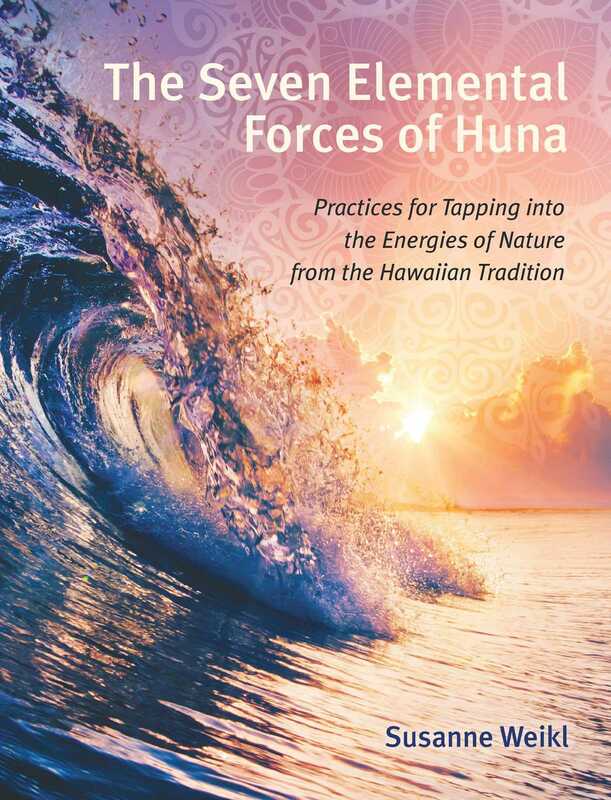 In this full-color practical guide, Susanne Weikl details how to connect mentally and spiritually with Huna’s seven elemental forces of nature--water, fire, wind, rock, plants, animals, and beings of light, including angels. Providing simple exercises, techniques, and rituals, she invites you to sense and meet each of the elemental forces and draw on their powers for manifestation and empowerment. You will learn to communicate directly with nature spirits, including gnomes, dwarfs, leprechauns, and the weather, and work with nature on an energetic level. You will learn how to build a wheel of the elements to anchor your connection to the energies of the elements and provide a conduit for easily accessing their powers at any time. You will also receive inspirational messages from each of the seven elemental forces. By connecting with the seven elemental forces of Hawaiian shamanism, you open yourself to an infinite reservoir of energy, an oracle for finding answers to difficult questions, a powerful support for manifesting positive outcomes, and an intuitive source for decoding symbols in nature. We each are already connected with nature and, with the practices in this book, we each can become a nature energy worker. Do you want to discover your essential nature? Do you want to learn just how powerful you are and how decisively you can act? Allow the energies of Nature to become part of your life. We find in Nature riches in all their infinite variety: in health, healing power, dynamism, energy, joyfulness, and essential power. What could be more important than using Nature as a source of power to bring fulfillment, incentive, inspiration, growth, healing, and ease into our lives? Instead of being modest, or managing your reserves of energy with care, you can now draw on Nature’s infinite source of energy. The relationship between humans and Nature has always been an intimate one, a love affair. Every force of Nature is a part of us and we are a part of these elements. Although it may seem to be the case sometimes, these elemental forces are not hidden, tamed, subdued or dormant. They are dynamic, elementally powerful, self-sufficient (in a positive way), and energetic. The elements are a part of our heritage, they are at work in our DNA. They help us and our ideas get the most out of life and feel truly alive! After a few times, when you feel confident enough, you can activate your heart with closed eyes. In this chapter, I will introduce you to some approaches that will lay good foundations, and a range of techniques that will help you gain easy access to the energies of Nature and enjoy a relaxed dialogue. Integrating the exercises into your life will help you translate this into immediate action. It is easy to make a connection with the elemental forces of Nature, and most people have no trouble in conducting a dialogue with these forces. We have all had this ability since childhood. And this fundamental concept has helped me to guide many people in seminars in Nature with success. I was recently reading a children’s book with my four-year-old nephew about a young hare who left his home and moved away. Wherever the hare lived, however, no one was allowed to tickle his ears; only his mom could do that. My nephew has a stuffed hare toy and he thought for a little while about whether he would be allowed to tickle its ears. He concentrated very hard on Mister Hare and then shook his head decisively. When I asked him how he could be so certain, he said he had simply asked Mister Hare. It’s just as simple and obvious for us adults, but instead of stuffed rabbits, we will be communicating with trees, rivers, and plants. Let’s release our inner child and employ our natural abilities. It might be hard work at the beginning, but with practice and support from Nature, you will take giant steps forward. I have selected two exercises that will help reactivate your child-like qualities. We play because we seek new experiences. If you watch children, you will soon spot their desire to play. There is a playful person within us all. What games do you like to play? These could include social or sports games, solving puzzles, bamboozling people, planning surprises, or simply sitting in a café and trying to guess who will turn their heads to look at you as they pass by. What does playing mean to you, and what satisfaction and joy can you find in it? Modern society does not embrace emotional outbursts, kicking and stamping of feet, or exclamations of joy. Let’s free our elemental natures from this modern “caged” attitude. Find a place outdoors in which Nature’s energies can flow freely, or a location surrounded by luxuriant fronds of ivy, on a windy hill, or among wild animals. Inhale its elemental force into your body and enjoy its wild power. Now you can be boisterous, loud, and deeply moved again; you can be elementally powerful in every way! Enjoy your beauty, Heal yourself! Never stop looking after your wellbeing! Carefree and curious in your actions, Intense and wise in your feelings, And loud and insatiable when you laugh. Fill your life with enjoyment and expectation! Susanne Weikl is a Huna teacher and part of the Alaka`i (experts) of Huna International, Hawaii, a specially selected group initiated in a deep way into Huna wisdom. She is a direct student of Serge Kahili King, one of the most renowned teachers of the long-standing tradition of Huna, and she regularly gives workshops in Hawaii and South Africa.